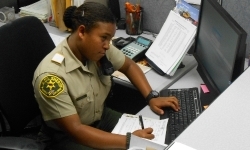 The Los Angeles County Sheriff's Department's Explorer Program is a career development and education program that is open to mature young adults who are between 14-20 years old and have an interest in the law enforcement profession. Its purpose is to provide training and experiences that assist young adults in making an informed decision as to whether or not they wish to pursue a law enforcement career. The program assists young adults in becoming more responsible, compassionate, independent and self-confident. Began in 1969, the program has made a positive effect on thousands of young people. 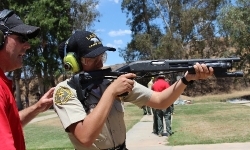 The Los Angeles County Sheriff's Department has explorer posts at 21 of its patrol stations and maintains three explorer training academies. Interested young adults must contact the Explorer Post Advisor at the Sheriff's station near them to get started. Recruitment usually occurs twice each year. The Post Advisor can assist with the application process and schedule an oral interview. An application screening and a background check is then conducted. If accepted, explorer applicants will be required to successfully complete a basic training academy. The initial training begins at either the STARS Center in Whittier, the Antelope Valley College in Lancaster or The College of the Canyons in Santa Clarita. The academy is 18-weeks in length and is held on Saturdays. Recruits learn basic concepts of law enforcement, drill, team building, physical conditioning, defense tactics, leadership and basic patrol skills. Recruits are responsible for weekly homework assignments and other academic requirements. A minimum GPA of 70% must be achieved and maintained in order to graduate. Graduates receive a certificate of completion, attend a graduation ceremony and earn the title, Deputy Explorer. High school elective credits and college units may be obtained for completing the explorer academy. Each year, a select number of Deputy Explorers are selected to attend the Explorer Leadership Institute, which is a live-in five day course that is held at Marine Corps Base Camp Pendleton. Explorers participate in leadership and organizational classes, and participate in several activities and presentations. Deputy Explorers are non-compensated, citizen volunteers who provide community services at their assigned Sheriff's station. Deputy Explorers serve at the will of the Explorer Post Advisor and may be discharged at any time. Deputy Explorers learn report writing, leadership, team-work, organizational skills and are eligible to participate in ride-a-longs with patrol deputies, once they complete the post-academy training at their patrol station. Deputy Explorers assist regular deputies with basic duties including: working the front counter, crowd management at community events, public finger printing, assisting at the complaint desk, filling and other duties. Deputy Explorers are responsible for purchasing and maintaining their uniforms and equipment. This includes uniforms required during the explorer academy. Deputy Explorers receive insurance coverage after being registered. The insurance coverage is renewed annually. IF INTERESTED, CONTACT THE EXPLORER ADVISOR AT YOUR LOCAL SHERIFF'S STATION FOR AN APPLICATION.